Cape Verde Minister of Health, Dr Arlindo Nascimento do Rosario. 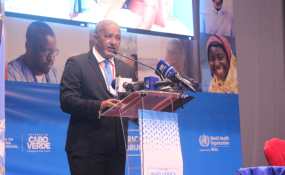 Issues bothering on identifying workable solutions to strengthen African health services, deliver more effective health security, and make significant inroads towards achieving universal health coverage will form the main thrust of the second WHO African Health forum holding in Praia, Cabo verde between March 26 and 28, 2019. The forum, billed to assemble global leaders and health experts will be hosted by the World Health Organisation (WHO) Regional Office for Africa and the Government of Cabo Verde . The forum has the theme "Achieving Universal Health Coverage and Health Security: The Africa We Want to See." According to the organisers, the objective of the event is to go far beyond dialogue to provide a platform where new partnerships, initiatives and programmes are forged to create meaningful and effective changes that will improve lives by making better healthcare available to all. Key themes will include the link between health security and achieving universal health coverage, multisectoral collaboration, private sector investment, harnessing technological solutions and youth engagement. WHO Regional Director for Africa, Dr Matshidiso Moeti, speaking on the relevance of the forum, said Africa's health challenges have become increasingly complex With the continent facing a growing number of outbreaks and the dual challenges of communicable diseases and chronic illnesses, and insisted that the region can't continue with business as usual. "This Forum will introduce innovations and kick start new partnerships which will reshape how we practice health," he said. According to him, the conference is taking place in Cabo Verde because the country has made huge strides in health since it became independent in 1975. The country has introduced innovations such as telemedicine and brought primary care to within 30 minutes of 80% of the population. observed that Africa faces a number of healthcare priorities and challenges resulting from epidemics and droughts, poor sanitation, lack of clean drinking water, insufficient numbers of trained medics and scarcity of access to affordable healthcare. "While delegates will be conscious of the financial constraints facing many African countries, we look forward to the Forums' insights on the intricacies of health care in Africa and the actions and solutions to create the policies and pan-African collaboration necessary to reach Africa's goal of universal health coverage and health security".